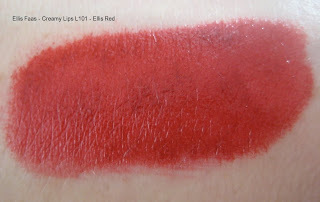 I recently purchased Ellis Faas's Creamy Lips - L101 Ellis Red. Ellis states on her website that she was "able to reproduce the colour that Snow White's mother wished for the lips of her child: blood-red. This red is probably the most 'human' of all the colours – and therefore the most versatile". Fairy tales have intrigued me about as much as red lipstick itself so it was difficult to resist buying this product. Ellis's creamy lips come packaged in a modern silver wand with a sponge tip applicator and click end that you turn to release the colour. 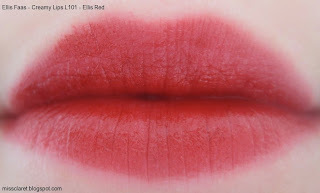 As described, L101 Ellis Red is a true blood red with minimal sign of any pink or orange undertones. It wears well and despite going on in liquid and glossy form, is creamy once on the lips. 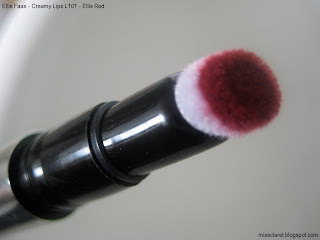 You can amp up the intensity of this shade with a few coats or wear sheer - personally I found it lovely either way.